A few weeks ago, I posted about creating a little forest critter out of flannel. Later in October, I had a chance to visit with my sister and we set out to make more critters using wool in place of the flannel. These little critters are from the book Countryside Softies by Amy Adams. They are really quick and easy to make! We made 2 foxes, a robin, a swan, and a dragonfly. We stayed up late each night having fun stitching these little guys together, and then we did some quilt shop hopping during the days. Here’a close-up of my fox wearing his cool heart-shaped shades. He’s going to be my little sewing room buddy! 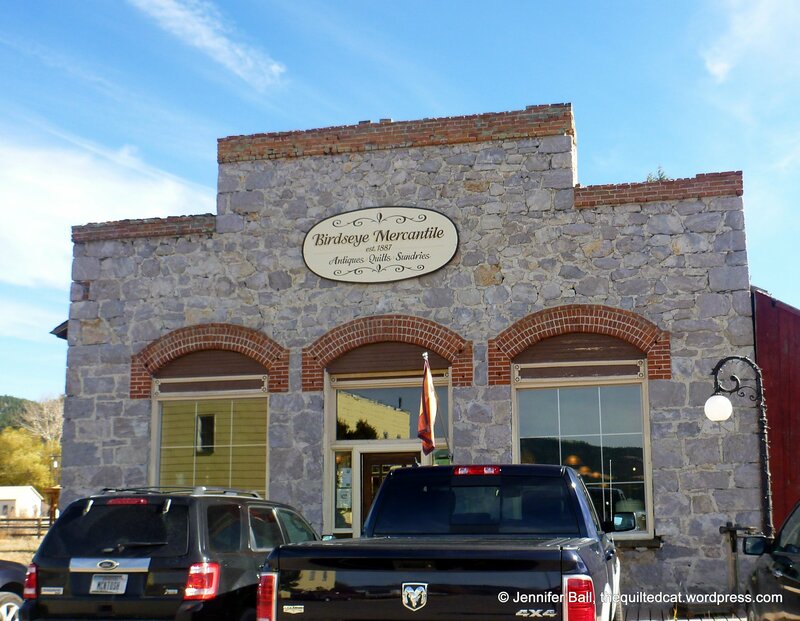 One afternoon, we took a little drive to visit Birdseye Mercantile in the little town of Avon, Montana located between Missoula and Helena. This adorable quilt shop has low overhead so they price all their quilting cottons at $7.50 per yard. Batiks are a little more. What a bargain! I took the opportunity to add a few pieces to my stash. If you are in the area, be sure to stop by and take a peek at this store. They are only open Fridays, Saturdays, and Sundays so it is always a good idea to call first. From Avon, we headed towards Seeley Lake to visit another favorite quilt shop, Deer Country Quilts. They have a beautiful log cabin building with over 6000 bolts of fabric! On the way to Deer Country Quilts, I took this picture of a lake reflecting the tamarack trees and their yellow autumn splendor. I didn’t have my good camera so this picture does not do them justice. They were just beautiful! 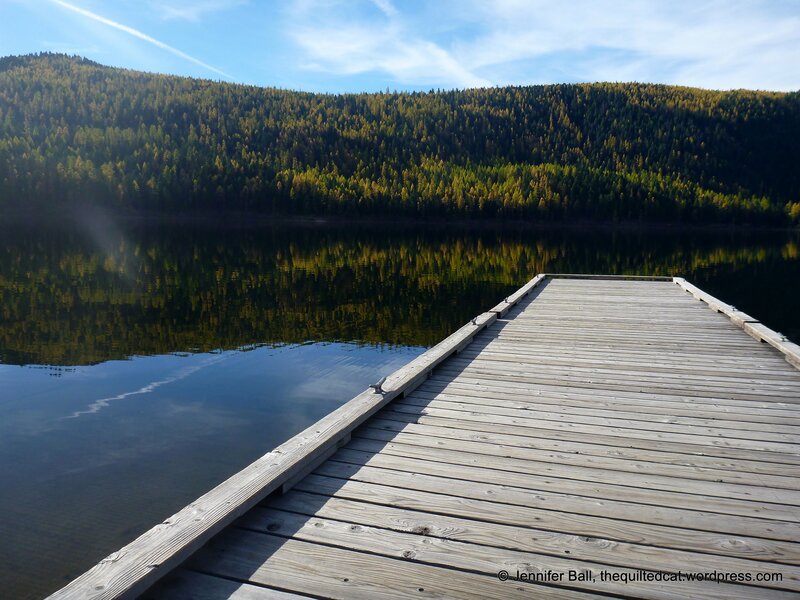 I wish that I had brought a quilt to photograph at the end of that dock! What a spectacular back drop for a quilt. 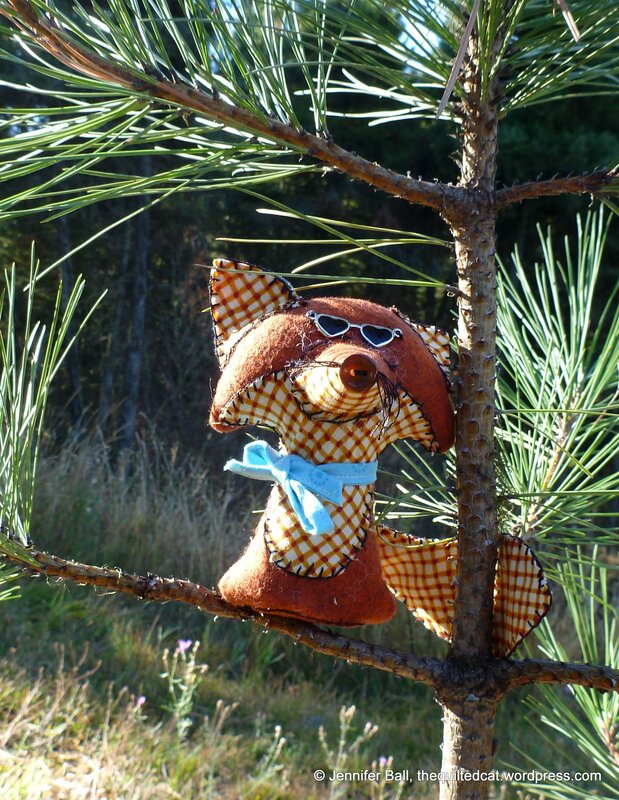 This entry was posted in Photography, Sewing, Travel and tagged Amy Adams, Birdseye Mercantile, Countryside Softies, Deer Country Quilts, Fall Foliage, Fox, Tamarack Trees, Wool Critters, Wool Fox by thequiltedcat. Bookmark the permalink. Adorable critters!!! The view…spectacular!!! Sounds like you had a blast!